Are You Busy Being Busy Or Busy Being Profitable? 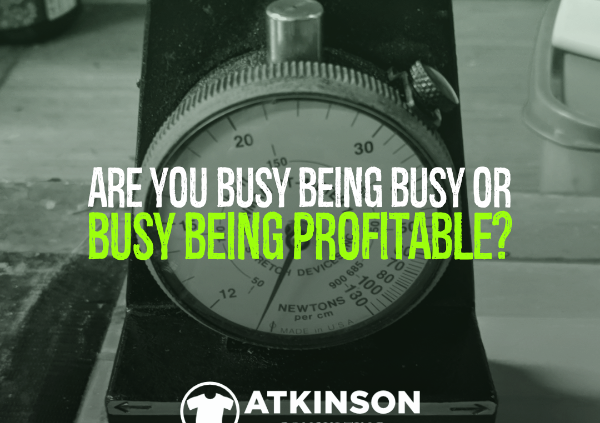 Quick question: Are you busy being busy or busy being profitable? It is a probing question that you should answer. Your goal for your business should be to maximize the profit as much as possible, right? So why do you take on work that might not be the best fit for your business? Let’s take a look at a few scenarios that are common in this industry. You’ve been dreaming about working with this client for years. Everywhere you turn, you see their apparel and just know if you only had a shot at that account just think about how all of that business could mean to your shop! The big leagues for sure. Then, the craziest thing happens. Your dream comes true. Then you get the details. They will drop ship you the garments, and you will have them the morning the job is to ship because it is such a rush. The art is still being developed, but you will have it by the end of the day. It is a five-color front and six-color back. It’s for an event, so it has to ship overnight and on their third-party freight account. They have to have them at the event on Thursday. Here’s the kicker. They will only pay $0.55 per side, and they don’t want to pay for screens. Cringing, you take the job. It is your chance to prove to this huge account that you can work with them. Of course, you pull it off. That’s what you do. Despite the fact that the art was late and had issues because the fonts weren’t converted to outlines and there was a missing placed image. That delayed getting the screens ready, but you were able to get the job printed, boxed up and ready to ship with about twenty minutes before the normal time UPS swings by for pick up. You remember distinctly that it felt like winning a race. Your effort certainly made an impression. Now, you are getting ten or twelve jobs a week just like this. Plus a promise of more. Finally, you get work from one of the top names in the business! Except, it’s not all that it is cracked up to be. They are so huge, that often there are communication or inventory issues. You’ve noticed that inventory just shows up without any instructions or a PO# reference. All of their orders are under your normal turn times. You now have two reminders with them to pay some outstanding invoices as they are in the 45+ AR column now. And the worst is that the pricing hasn’t improved either. Doing the math, you realize that Goliath as leveraged their name for the “opportunity” to work with them. You start to feel dirty and used. It’s no wonder that last vendor didn’t want that last minute job that started the entire crazy parade. Meanwhile, you have been blowing off steady customers that have been with you for years. One or two have dropped out because they no longer “get the service we have been used to” since you started up with the big boys. Worse, looking at your bottom line your production totals have barely increased, but your labor, overtime, and consumables are up over 30% from last year. It doesn’t take much effort after that to realize that you have sacrificed long-term commitments for the short-term glamor of working with a celebrity company. There is this type of customer that walks through your door or calls on the phone at least twice a week. Price is the only thing that matters to them. For this part of the article, let’s call that customer “Tire-Kicker Bill”. Tire-Kicker Bill doesn’t care about anything other than the bottom line price. If you are a nickel under that other shop, you win his heart. That is of course until someone is a nickel lower than you. I’ll bet you have met Tire-Kicker Bill. You met his price that one time. Jumped through all of those ridiculous hoops. Listened to his complaints about this or that about your shop. Even built out multi-page elaborate quotes that took hours to put together. That last one you had to research involved finding a particular boonie-hat made from some special material…and it “can’t have grommets” because Tire-Kicker Bill saw a movie once where the actor had a hat without them. What’s ironic is that his last order was a Rush job that he just had to have. You reluctantly waived the Rush fee, because that boonie-hat order was still pending and it was (at the time) quite large. It’s been almost three weeks since that ship date for the Rush job and Bill hasn’t been back to pick it up. Muttering under your breath, you swear, “Never again with this guy”. A week or so ago I was talking to someone and asked him what it cost him to screenprint a shirt. He told me it was about $0.35. I asked him how he arrived at that number and he said he read it somewhere, and that he couldn’t really remember. For your shop, do you know what it costs you to decorate one location on average? What is the average number of impressions you can produce in an hour for screenprinting, embroidery, DTG, heat press, dye sublimation, or whatever other decoration methods you have in your shop? By the way, this is usually NOT what is on the control panel of the machine. Instead, only count finished pieces on the table ready for packaging. Have you ever calculated the percentage of average downtime you have in production per day? Can’t you just use the “average of all the shops around me” method for pricing anyway? For starters, if you want to dial in your pricing you need to think about how the efficiency of your shop, combined with all of your costs contribute to your pricing scenario. You need to start somewhere. Using the actual real math of how your shop operates is the best way to do it. Once you get a good handle on your costs, you can see that taking some of the orders that constantly show up in your system could be a bad idea. If you are truly interested in maximizing your profit and making sure you are calculating your pricing correctly, grab my eBook “Price for Profit”. 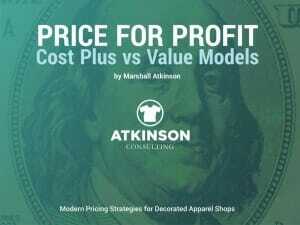 You can use this book as a tool to build a baseline for your costs and efficiency. From there, you can build out and sell on the value you are bringing to the table and mark that up accordingly. There is no reason to do it incorrectly. Time, as they say, is fleeting. There is only so much of it to go around. Yet, in your shop, your team may be constantly wasting it and not even realize it. For example, have you ever created two or three designs and your customer will “pick the one they like the best”? Which means essentially that your art costs are two to three times higher than normal. What do you think happens when the customer tweaks and changes each of the submitted designs? Then they, of course, decide that they don’t like any of them. Or worse, doesn’t go through with the order. And because you are only charging them based on the print, there isn’t any money involved yet. How much do you pay your art staff again? Take a hard look at this type of non-value-add work that you are doing in your shop. Why are you allowing that? Sure you want happy customers and wish to serve them well. No problem in that. But your workflow process should be built on the efficient use of time. Eliminate any rework for starters. Any time you are doing something more than once, get that on a list or a chart and dig into it. How did that happen? Can you create a mechanism or process to eliminate that rework? Usually, the reason why these things happen is that nobody really says anything. Rules and methods morph into the laziest state possible. The art department has to create two or three designs because the sales team can not articulate the customer’s wishes well enough to do the design once. It’s a similar refrain in other departments. Want more profits? Use time wisely. One of the biggest challenges this industry faces is with how art is handled. In your shop, is your creative team constantly behind? Do they have a constant battle with how to schedule those complex creative jobs that bring in the money with the grunt work that has to be sent out for approval? There is a sweeping change in this industry that you should know about, and that is with outsourcing artwork. Don’t get caught with being busy being busy. Reduce your art costs with professionals! 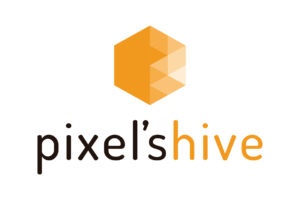 Recently, I’ve partnered with a company in Argentina called Pixel’sHive. Take it from me, these guys know their stuff and do great work. It isn’t with only simple art either. They can do embroidery digitizing, complex separations, business cards, and brochures, video and animation, and even build you InkSoft Stores for you. If you have any question, please contact me too. 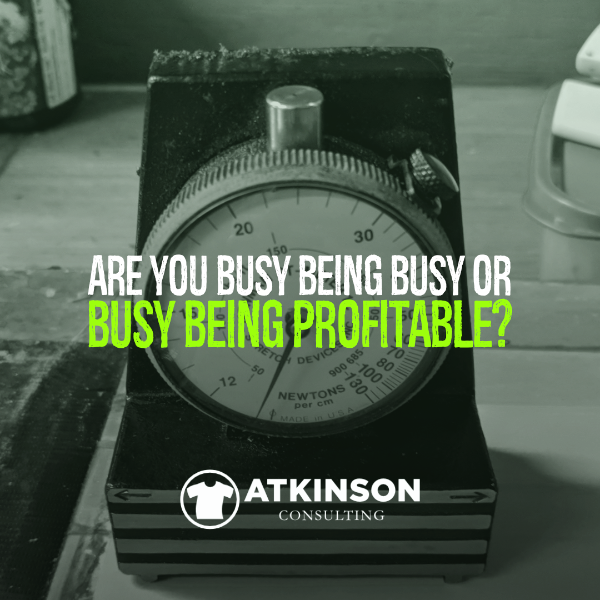 https://atkinsontshirt.com/wp-content/uploads/2018/10/BUSY-BEING-BUSY.png 600 600 atkinsontshirt https://atkinsontshirt.com/wp-content/uploads/2018/10/ATKINSON-CONSULTING-HORIZ-256.png atkinsontshirt2018-10-13 14:22:582018-10-24 11:58:18Are You Busy Being Busy Or Busy Being Profitable?